This item was submitted by one of our regular contributors - thank you Paul, from Barrie, Ontario! With our backyard backing onto a wetlands, we have many visitors. Some with four legs, some with two, and some with none at all! 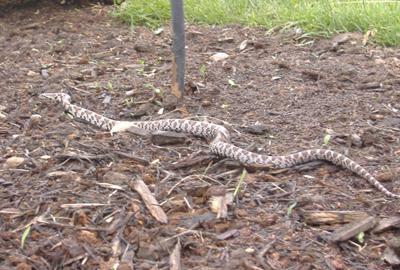 A fairly uncommon Eastern Milk Snake came by the other day and was sunning on our patio stones. As I approached it, it reared up and shook its tail, like a rattler, and came towards me instead of away. When I didn't move, it settled down as its "display" was done and it moved on around my yard. A beautiful and completely harmless snake, I REALLY hope it visits again. My son is always bringing home and touching snakes that make my skin crawl. Not being a fan of the no-legged friends, I wish he would leave them alone. Today it was a baby Milk snake. we looked at many and decided that was what it was. He is so facinated with them that I let him keep a tank just so he can observe them, but he has to let them go. He decided to keep this one over-night to show his Dad. I did not know it was a protected snake. I will be sure it gets set free in the morning as it is almost ten at night and he was afraid it would be too cold tonight. Thanks for all the info we found and he wished he had never touched it knowing it is a protected species. Now he will never keep another one for the love of the slithering things.